This is a species of concern. 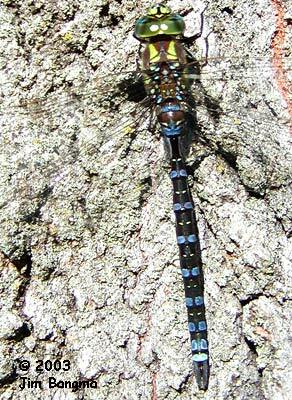 Please report any encounters to Odonata Central. Found in the Ridge & Valley and Highland areas of NW Jersey. 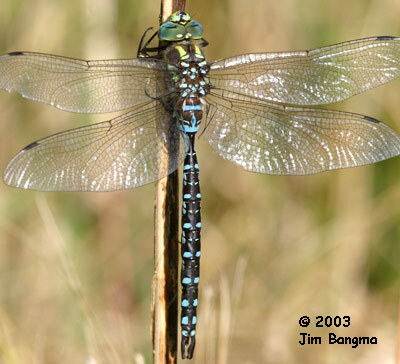 Found along marshy ponds and streams and often among the vegetation of seasonal ponds. Flight season charts created from records in the official database maintained by Allen Barlow. 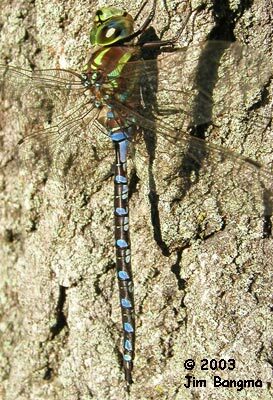 Probably our brightest darner, with broad lateral thoracic stripes of blue or green fading to yellow ventrally. The anterior stripe is nearly straight with a rearward projection at the top. 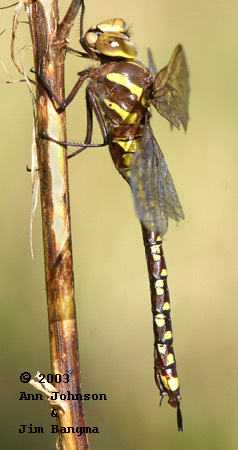 Male abdominal spots are usually bright blue. 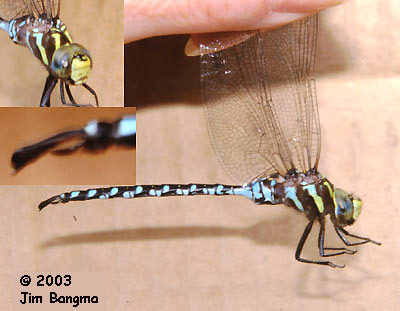 Females may occur in yellow, green and blue color phases. 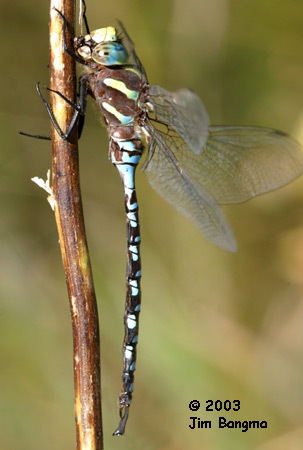 Cerci are flattened vertically with a posterior spike, similar to the much duller (but still pretty in its own subtle way) Shadow Darner. The NJDEP's Natural Heritage Program classifies and tracks rare species of odonates in New Jersey to help prioritize conservation efforts and NJOS strongly supports their efforts. They use standardized state and global rankings that were developed by the Nature Conservancy and NatureServe. See below for the full definition of the ranks that are used in this site. The NJDEP Natural Heritage Program maintains its own web site with information on their on-going programs and data on many other animals and plants. Click here to explore their site but please, come back soon! Following are the State element ranks used in tracking NJ odes (and other organisms as well). Click here for the Global ranks which are also displayed in our database. S1 Critically imperiled in New Jersey because of extreme rarity (5 or fewer occurrences or very few remaining individuals or acres). Elements so ranked are often restricted to very specialized conditions or habitats and/or restricted to an extremely small geographical area of the state. Also included are elements which were formerly more abundant, but because of habitat destruction or some other critical factor of its biology, they have been demonstrably reduced in abundance. In essence, these are elements for which, even with intensive searching, sizable additional occurrences are unlikely to be discovered. S2 Imperiled in New Jersey because of rarity (6 to 20 occurrences). Historically many of these elements may have been more frequent but are now known from very few extant occurrences, primarily because of habitat destruction. Diligent searching may yield additional occurrences. S3 Rare in state with 21 to 100 occurrences (plant species in this category have only 21 to 50 occurrences). Includes elements which are widely distributed in the state but with small populations/acreage or elements with restricted distribution, but locally abundant. Not yet imperiled in state but may soon be if current trends continue. Searching often yields additional occurrences. S4 Apparently secure in state, with many occurrences. S5 Demonstrably secure in state and essentially ineradicable under present conditions. SA Accidental in state, including species (usually birds or butterflies) recorded once or twice or only at very great intervals, hundreds or even thousands of miles outside their usual range; a few of these species may even have bred on the one or two occasions they were recorded; examples include European strays or western birds on the East Coast and vice versa. SE Elements that are clearly exotic in New Jersey including those taxa not native to North America (introduced taxa) or taxa deliberately or accidentally introduced into the State from other parts of North America (adventive taxa). Taxa ranked SE are not a conservation priority (viable introduced occurrences of G1 or G2 elements may be exceptions). SH Elements of historical occurrence in New Jersey. Despite some searching of historical occurrences and/or potential habitat, no extant occurrences are known. Since not all of the historical occurrences have been field surveyed, and unsearched potential habitat remains, historically ranked taxa are considered possibly extant, and remain a conservation priority for continued field work. SP Element has potential to occur in New Jersey, but no occurrences have been reported. SR Elements reported from New Jersey, but without persuasive documentation which would provide a basis for either accepting or rejecting the report. In some instances documentation may exist, but as of yet, its source or location has not been determined. SRF Elements erroneously reported from New Jersey, but this error persists in the literature. SU Elements believed to be in peril but the degree of rarity uncertain. Also included are rare taxa of uncertain taxonomical standing. More information is needed to resolve rank. 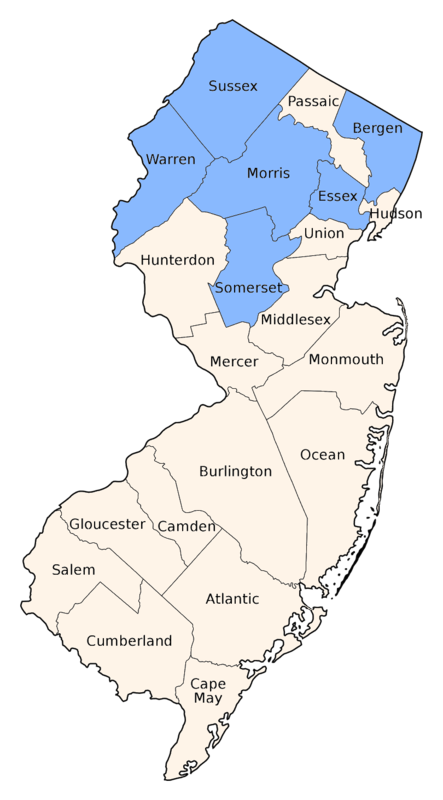 SX Elements that have been determined or are presumed to be extirpated from New Jersey. All historical occurrences have been searched and a reasonable search of potential habitat has been completed. Extirpated taxa are not a current conservation priority. SXC Elements presumed extirpated from New Jersey, but native populations collected from the wild exist in cultivation. SZ Not of practical conservation concern in New Jersey, because there are no definable occurrences, although the taxon is native and appears regularly in the state. An SZ rank will generally be used for long distance migrants whose occurrences during their migrations are too irregular (in terms of repeated visitation to the same locations), transitory, and dispersed to be reliably identified, mapped and protected. In other words, the migrant regularly passes through the state, but enduring, mapable element occurrences cannot be defined. Typically, the SZ rank applies to a non-breeding population (N) in the state - for example, birds on migration. An SZ rank may in a few instances also apply to a breeding population (B), for example certain lepidoptera which regularly die out every year with no significant return migration. Although the SZ rank typically applies to migrants, it should not be used indiscriminately. Just because a species is on migration does not mean it receives an SZ rank. SZ will only apply when the migrants occur in an irregular, transitory and dispersed manner. B Refers to the breeding population of the element in the state. N Refers to the non-breeding population of the element in the state. T Element ranks containing a "T" indicate that the infraspecific taxon is being ranked differently than the full species. For example Stachys palustris var. homotricha is ranked "G5T? SH" meaning the full species is globally secure but the global rarity of the var. homotricha has not been determined; in New Jersey the variety is ranked historic. Q Elements containing a "Q" in the global portion of its rank indicates that the taxon is of questionable, or uncertain taxonomical standing, e.g., some authors regard it as a full species, while others treat it at the subspecific level. .1 Elements documented from a single location. Note: To express uncertainty, the most likely rank is assigned and a question mark added (e.g., G2?). A range is indicated by combining two ranks (e.g., G1G2, S1S3). NJOS note: Definitions for element ranks are after The Nature Conservancy (1982: Chapter 4, 4.1-1 through 4.4.1.3-3). G1 Critically imperiled globally because of extreme rarity (5 or fewer occurrences or very few remaining individuals or acres) or because of some factor(s) making it especially vulnerable to extinction. G2 Imperiled globally because of rarity (6 to 20 occurrences or few remaining individuals or acres) or because of some factor(s) making it very vulnerable to extinction throughout its range. G3 Either very rare and local throughout its range or found locally (even abundantly at some of its locations) in a restricted range (e.g., a single western state, a physiographic region in the East) or because of other factors making it vulnerable to extinction throughout it's range; with the number of occurrences in the range of 21 to 100. G4 Apparently secure globally; although it may be quite rare in parts of its range, especially at the periphery. G5 Demonstrably secure globally; although it may be quite rare in parts of its range, especially at the periphery. GH Of historical occurrence throughout its range i.e., formerly part of the established biota, with the expectation that it may be rediscovered. GU Possibly in peril range wide but status uncertain; more information needed. GX Believed to be extinct throughout range (e.g., passenger pigeon) with virtually no likelihood that it will be rediscovered. G? Species has not yet been ranked. Odes don’t vote and hence have no voice in land use matters. The more we know about their status in New Jersey the better. 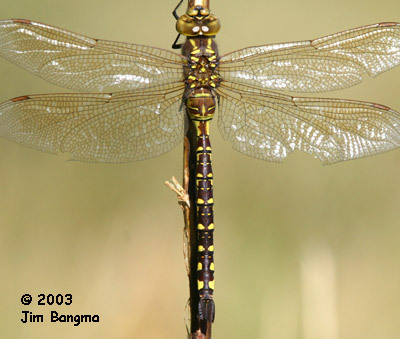 Information is critical to help protect these insects and their habitats.